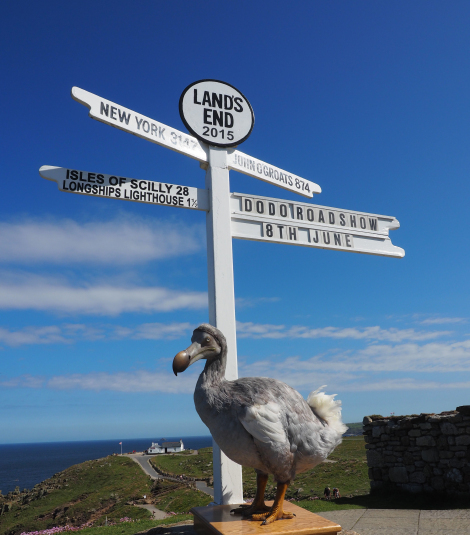 To mark the Oxford University Museum of Natural History’s nomination in the 2015 Art Fund Prize for Museum of the Year, the famous Oxford Dodo embarked on an ambitious tour: beginning at Land’s End, the Dodo travelled the full length of Britain, all the way to John O’Groats, in just one week, visiting museums and galleries along the way. As part of the Museum’s nomination for Museum of the Year in 2015, Art Fund announced that they’d like each of the finalists to come up with a creative way to celebrate their nomination. Around the same time, the National Museums Directors’ Council launched their I Love Museums campaign, so Oxford University Museum of Natural History wanted to do something that wasn’t only fun and creative, but also celebrated the rich diversity of museum collections in the UK. The Dodo Roadshow aimed to reach and engage a very broad audience, from school groups to adults and families. By travelling the length of the country, the idea was to meet and connect people from different towns and cities that had not visited or even heard of the Museum. Due to the reciprocal nature of the roadshow, we also aimed to engage with lots of different museum professionals as well, building new connections and forming new professional relationships. The main aim of the Dodo Roadshow was to showcase the richness and variety of museum and gallery collections, as well as other cultural and natural heritage sites in Britain, while celebrating our nomination for the Art Fund Prize for Museum of the Year 2015. The Dodo Roadshow endeavoured to reach and engage a large and broad audience by visiting 24 different venues across the UK. By touring the dodo, the Museum set out to offer people the chance to meet its most iconic specimen and for museums across the country to showcase their own most iconic specimens and artefacts. With only three weeks from idea to delivery, there was a lot to organise in a very short space of time. After choosing the route, a number of different cultural venues were contacted and they all agreed to take part. Eleven staff, split into three tag teams, took the Dodo model along with a cast of the head, and real Dodo foot bones on the trip. The Museum’s star specimen met with star objects from every museum and gallery on the tour. At each stop, the Dodo 'interviewed' fellow star objects for a series of Q&A articles that were published on the Museum’s blog. The roadshow took over the @morethanadodo twitter feed for a week, updating the museum’s thousands of followers about each visit. Over the course of eight days, the Dodo Roadshow visited and connected with 24 different cultural venues, and engaged with over 1,000 people from across the country. The museum blog had over 7,000 views during the roadshow and the @morethanadodo Twitter feed had over 10,000 visits. The Dodo Roadshow was great value for money, as it was delivered on a very small budget. It turned out to be a successful real world and digital campaign, and enabled a number of different museum professionals to meet and share their work and collections. The Museum staff involved came from all across the institution, which meant that it also served as a successful team-building exercise. For all involved, it was a fantastic project that provided a unique experience. Due to the circumstances, the team only had three weeks to deliver the Dodo Roadshow, which meant a shift of work focus for a few weeks in order to get everything ready. This isn’t the way the Museum would usually work, but in this case it proved very successful. The Museum was incredibly lucky to have received such an enthusiastic response from the hosting venues. It meant that venues supported press and marketing, and put a lot of effort into encouraging local visitors to come along and meet the Dodo; for example, Ullapool Museum managed to get the majority of the town along to visit. It showed just how important collaborative working is. "We were thrilled to be asked to be part of the Dodo Roadshow – in the lead up to our visit, it felt like the whole city was squawking with excitement!"